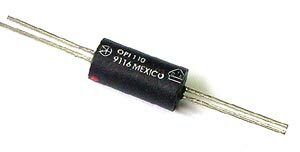 Each Optoisolator contains an 890 nm infrared Light Emitting Diode (LED) and an NPN Photosensor. The devices are sealed in a precast opaque housing with a optically transmissive path between the LED and the photosensor. This series is designed for transmission of information between one power supply and another where the voltage potentials during surge conditions are not greater than the guaranteed isolation voltage.